If you are struggling to find the right gift for a relative or close friend, then why not consider purchasing them a personalised engraved gift? Personalised gifts are the perfect way to show someone just how special they are to you. They are also ideal for the man or woman who seems to already own everything! Whether you are buying a birthday, christening, wedding or graduation present, a personalised engraved gift is sure to be well received. Personalised engraved gifts like champagne flutes are ideal for wedding and anniversary presents. One of the best ways to personalise a gift is to have the recipient’s name engraved on it. People love to own items that feature their name as it tells everyone else that it belongs to them. All types of gifts from expensive jewellery to low cost key rings can be personalised, providing that they are made from a suitable material. An alternative way you could personalise a gift is by having a date engraved onto its surface. This may be the recipient’s birthday or it could be a day that holds significance to the both of you. For example, your wedding date, the day you first met or the date you got engaged. Although many people go down the name or date route when having gifts engraved, if you want to make your present all the more special, why not consider having a quote engraved instead? If you are purchasing a gift for your partner for their birthday, Valentine’s Day or anniversary, you may want to consider having a quote from your favourite romantic movie or poem engraved on their gift. Alternatively, if you are buying a gift for your best friend, you could have a memorable quote of theirs engraved onto their gift. This may be something profound that they have said or something extremely funny. If you are looking to purchase a personalised engraved gift, see our gift guide below for inspiration! If you are looking to splash out on your girlfriend, best friend, sister or mother, then why not treat them to a personalised engraved piece of jewellery? Lockets are a wonderful idea, as along with personalising them with their name, their birthdate or a quote they like, they can also go onto personalise it themselves by putting pictures of their loved ones inside. 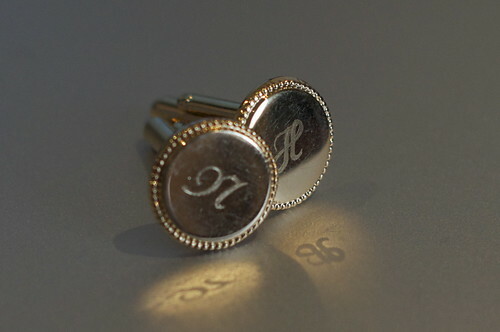 Cufflinks featuring a person’s initials can make a lovely personalised engraved gift. Personalised engraved hip flasks and tankards usually go down well with men. However if the special man in your life is not a drinker, you may want to consider purchasing them a pair of personalised engraved cufflinks. Although cufflinks are small, they can still be engraved with a person’s initials or birthdate and will make a lovely gift for someone special. If you have friends that are getting married or your parent’s are celebrating a milestone anniversary, you could treat them to a set of engraved champagne glasses or even a bottle of vintage wine featuring their names and wedding date. The great thing about buying a newlywed couple a bottle of personalised vintage wine is that they can set a date to open in together in the future, after many happy years. When it comes to choosing personalised engraved gifts the possibilities are endless, visit a site such as http://www.designerengraving.co.uk/ for inspiration. With so many different gifts to choose from, you are sure to find something that the special person in your life will love. If we could just offer one quick tip for having personalised gifts engraved it would be to double check your spellings and dates. There would be nothing worse than spelling the recipient’s name incorrectly or getting their date of birth wrong, especially after going to the trouble of getting them such a special and unique gift!